A Baltimore native, Alec Hiller met the bass at age nine. Studying with Paul Johnson in the years that followed, he continued this relationship as an undergraduate at the Peabody Conservatory, where he would also study with National Symphony bassist Ira Gold. 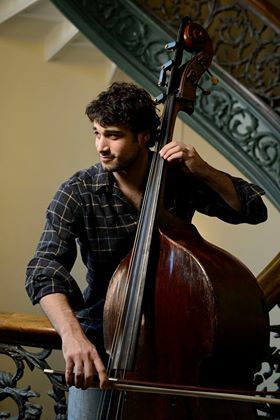 Alec then traveled to Montreal, where he earned a master’s degree from McGill University studying with Ali Yazdanfar, Principal Bass of the Montreal Symphony Orchestra. Currently a member of the Virginia Symphony Orchestra, Richmond Symphony Orchestra and Maryland Symphony Orchestra, Alec has also appeared with many other premier orchestras up and down the east coast including the Baltimore Symphony Orchestra, Montreal Symphony Orchestra and National Symphony Orchestra. Having taught at the Peabody Preparatory, Alec also receives a great amount of joy from working with children. He currently teaches at Morgan State University and The Bryn Mawr School while also maintaining a private studio in Baltimore County. During the summer Alec can be found teaching at Bass Works and the Baltimore String Orchestra Camp.